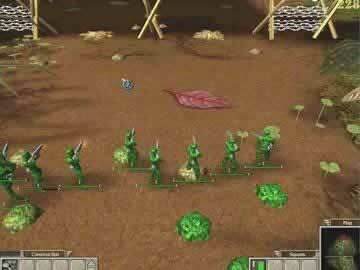 Army Men RTS Game Review - Download and Play Free Version! RTS Battles with Plastic Soldiers, Tanks, and More! Army Men RTS brings your fantasy fights between plastic army guys to life (well, kind of) in a solid real time strategy game. Your job is to lead Sarge and his band of bazooka men, grenadiers, machine gunners, flame throwers, and plastic military vehicles in a campaign to defeat the evil Tan army. Like most RTS games, you build bases but instead of mining resources you use trucks to siphon off plastic and electricity from objects to make men and then build an army fit to defeat the rebels. One of the best things about Army Men RTS is its faithfulness to bring the nostalgia of army toys into something you can really play and command. Included are some great characters like Sarge, the commander and other hero fighters that join you on different missions. You can even build tanks, choppers, artillery, anti-aircraft, guard towers and alot more. Have a blast commanding all the familiar army men types and vehicles you used to play with (or blow up with firecrackers like I did). Be incredibly amused by the antics of the plastic toys and their serious battle determination. Succeed in defeating the evil Tan army? Download it now and find out! 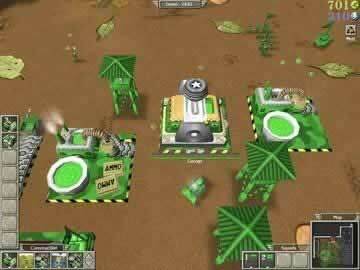 Army Men RTS is a real-time strategy title that lets you take command of your favorite little green soldiers to take on the Tan army and defeat a defecting Green general. It has all the traditional RTS elements such as resource harvesting, base building, and commanding armies of units around the battlefield. The interface is very simple and easy to use with most commands and camera movements controlled by the mouse. The unique setting and world of Army Men provides a refreshing new twist to this classic game genre. There isn't anything like exploring flower gardens and counter tops as you take out Tan bases, try to capture an infinite power source, or escape from a basement infested with ants. It is really fun to send out your plastic soldiers and take advantage of the varied unit types, such as the grenadier, medic, half-track, and mortar men, each with their own strengths and weaknesses. There are also several hero units like Sarge, Hoover, Riff, and Scorch, and the game does a good job of giving each of them their own personality and appeal. Also, the resource system is rather intriguing as you harvest various mundane items like toy robots, frisbees, and watches for plastic and electricity. You can even collect plastic from fallen soldiers and destroyed buildings! There are, however, a few slight issues which can detract from the gameplay. For starters, you can only create four unit groups which is quite a constraint considering the varied unit types. Also, the pathfinding for large groups of units isn't the best and can be the cause of frustration as your font-line units get stuck behind your support troops. This is further complicated by the fact that you can't really adjust your units' behavior and they attack any enemy unit on sight. This can cause some problems when attacking enemy bases since your mortar team needs one of your units in sight of the target but that unit tends to want to just rush in and attack, which can mess with your strategy. Finally, there isn't a whole lot of replay value since there is only the linear campaign and single-scenario Great Battles, which have environments taken from the campaign. 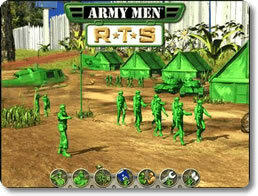 Army Men RTS provides a fun and gratifying RTS experience. The variety of units and heroes are a pleasure to play around with and the unique gameplay universe is both refreshing and fascinating. There are some issues which hamper the gameplay slightly, but the addicting gameplay tends to make up for this. Overall, Army Men RTS is a great game for new players to the genre to jump right into and hard-core fans can find some enjoyment with its originality, though they might be turned off a bit by its lack of complexity. Player created video showing game clips.